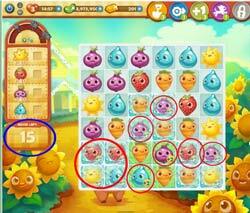 These Farm Heroes level 518 cheats and tips will help you beat level 518 of Farm Heroes. 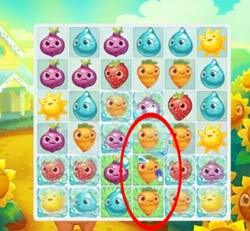 The objective of Farm Heroes level 518 is to collect 36 suns, 36 strawberries, 36 onions and 36 raindrops in 15 moves. Level 518 Cheat #1: Unfreeze frozen cropsies! There’s not way you’re going to beat this level with all those frozen cropsies. You need to collect them! You can unfreeze cropsies by making a match with the frozen cropsie. But remember, you can’t move cropsies that are frozen! You can also use your shovel to dig out a frozen cropsy. A lot of the cropsies on this level already start out with a bonuse on them. Try to make matches with them! It’ll make it easier to beat the level when you only have 15 moves. There’s a lot of grass on this level, so use it! 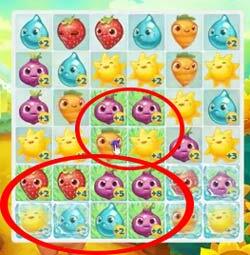 Matches made on the grass will accumulate bonuses for your cropsies. This will be really helpful in beating the level.